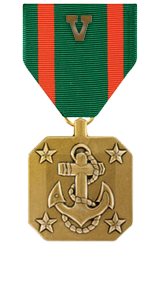 Professional achievement in the superior performance of his duties while serving as patrol leader, 3d Platoon, Company I, 3d Battalion, 3d Marines, Regimental Combat Team-7, I Marine Expeditionary Force Forward, on 27 May 2006, in support of Operation IRAQI FREEDOM. Lance Corporal Camille was leading a combined patrol when he came under heavy enemy machine gun fire. Lance Corporal Camille immediately directed his patrol towards the enemy and coordinated with the Iraqi soldiers in order to employ the squad’s full fire power on the enemy. Exposing himself to enemy fire, Lance Corporal Camille was establishing a cordon around a building suspected to be occupied by the enemy, when he spotted a vehicle from which enemy fire had originated from moments earlier. He immediately directed his team to stop and search the vehicle. The vehicle was then thoroughly searched, and two enemy insurgents were detained. Because of Lance Corporal Camille’s superb leadership, his squad effectively denied the enemy an escape route. Lance Corporal Camille’s initiative, perseverance and total dedication to duty reflected credit upon him and were in keeping with the highest traditions of the Marine Corps and the United States Naval Service.